Open-air theatre, built by converting a quarry. Part of the Union Buildings complex of government buildings. 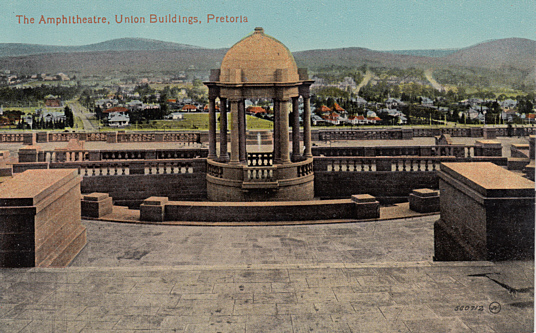 Opened as "Union Buildings Amphitheatre", intended for gatherings of national and ceremonial importance. 2013 renamed "Nelson Mandela Amphitheatre" in honour of the South African politican, Nelson Mandela (1918-2013). 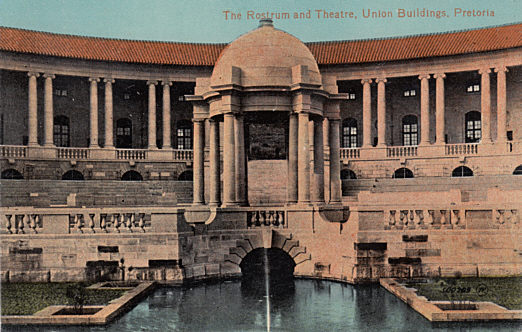 Front Text: "The Rostrum and Theatre, Union Buildings, Pretoria"
Front Text: "The Amphitheatre, Union Buildings, Pretoria"